Fats in the human body are known as “Med” in Ayurved, when such fats exceed certain limits it causes obesity and other related problems. So it is necessary to reduce such unwanted fat. There are numerous reasons for increase in fat levels in the human body such as, stress at work, excess intake of sweet food, eating oily food, or hereditary issues, which lead to less burning of calories in the human body. Excess hunger can lead to heavy intake of food, which can lead to cardiac problems, liver & kidney stones etc. •	Strengthens the stomach and promotes its action, improve appetite, stimulating the secretion of gastric juices to ingest the fat. 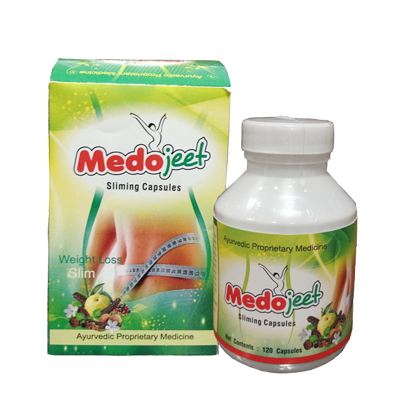 •	Reduced body fat accumulation, in part, by stimulation of energy expenditure Medojeet Capsules widely uses such ingredients that helps us to improve the rate of digestion. Under normal circumstances it takes three to four months for the body to get rid of unwanted body fats , using Medojeet Capsules with Medojeet syrup one begins to feel lighter & healthy within a month. – The herb known to slow down the body's ability to store fat, potentially enabling more fat from foods to pass through the body without being stored. Additionally, HCA blocks the production and storage of fat and cholesterol when calorie consumption exceeds healthy levels. The herb is also known to reduce blood lipid levels and to naturally lower cholesterol. – The medicine is also used in anti-obesity treatment, which acts as a great stimulant for controlling the diet. – It acts as a cleansing agent on the urinary system to dissolve the kidney stones and clear the urinary bladder commonly use the Gokshura capsule in order to enhance and tone their bodies. – Fenugreek has exclusive properties which fight obesity and diabetes. – For the obese, fenugreek fights the fat cells and reduces the overall body weight – helps fight flatulence, indigestion and keeps the bowels highly functional. – Remarkable ability to lower cholesterol, triglycerides and LDL levels while raising HDL levels. – Intake of Aloe vera gel reduced body fat accumulation, in part, by stimulation of energy expenditure. – Aloe vera gel might be beneficial for the prevention and improvement of diet-induced obesity. – Aloe Vera can stimulate the metabolic rate of the body. This results in increased energy consumption in the body. – As a result of this, the food that is eaten is converted into energy at a faster rate and is utilized by the normal functions of the body. – This prevents conversion of this energy to fat. – It also mobilizes the unused, stored fat in the body and converts it into energy that is again utilized faster. – This helps the patients with an obesity problem to lose their weight faster due to the reduction of excess fat from the body. – Significant reduction in weight gain without affecting food consumption – Decrease in serum total cholesterol, triglyceride levels and different organ weights and fat pad weights.